After anticipating rising interest rates for years, investors’ expectations are finally coming to fruition. 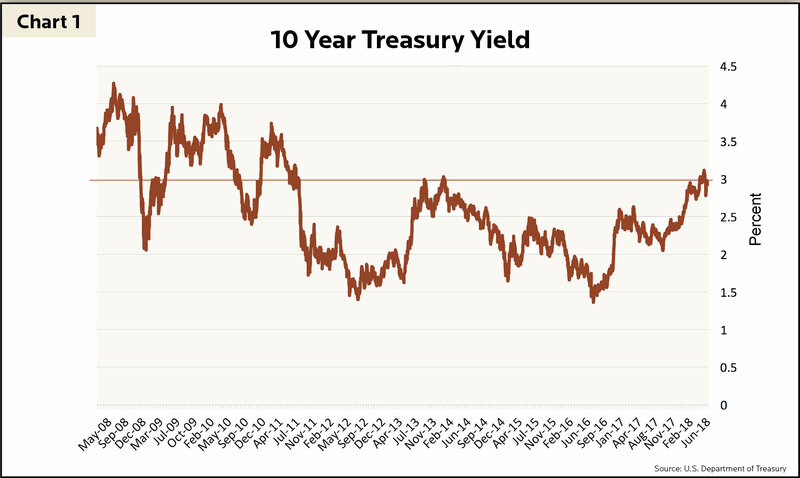 In the summer of 2016, the 10-year Treasury yield briefly dipped below 1.5%, as expectations of economic growth and inflation sagged. Things have since changed – at the end of April 2018, the 10-year Treasury yield surpassed 3% for the first time in four years (Chart 1), creating a ripple effect through financial markets. Market participants worry the long downward march in yields, which began in the 80s, may be over. Changes in U.S. monetary and fiscal policy are likely to promote rising interest rates. Regarding monetary policy, the Federal Reserve (“the Fed”) continues to raise The Fed Funds Rate, which is the gauge for interest rates in the United States. The Fed is also trimming back its bond holdings amassed since the financial crisis, which will indirectly push interest rates higher when paired with fiscal policy changes. On the fiscal policy side, government spending is projected to grow rapidly over the coming decade, driving the government to issue more bonds to finance its growing budget deficit. The potent combination of the Fed buying less bonds and the government issuing more bonds increases supply while demand remains stagnant. As a result, bond yields will rise until they become attractive investments again and push demand back in-line with supply. The era of ultra-easy monetary policy and low interest rates approaches its end because the economy is the healthiest it has been since the Financial Crisis. Monetary policy tightening should be viewed positively, as it demonstrates the Fed’s confidence in the economic progress the U.S. has exhibited. However, interest rate hikes amplify the government’s cost of borrowing. This more expensive borrowing will be coupled with the growing federal budget deficit. Recent tax cuts are expected to cost around $1T over the next decade, and the government budget deal passed in March adds to the $14.8T of U.S. national debt. Under current law, federal outlays in 2018 will be $4.1T, a number projected to grow at an average annual rate of 5.5% over the next decade and reach $7 trillion in 2028. Chart 2 highlights Social Security, Medicare, and net interest expenses account for more than two-thirds of that increase. 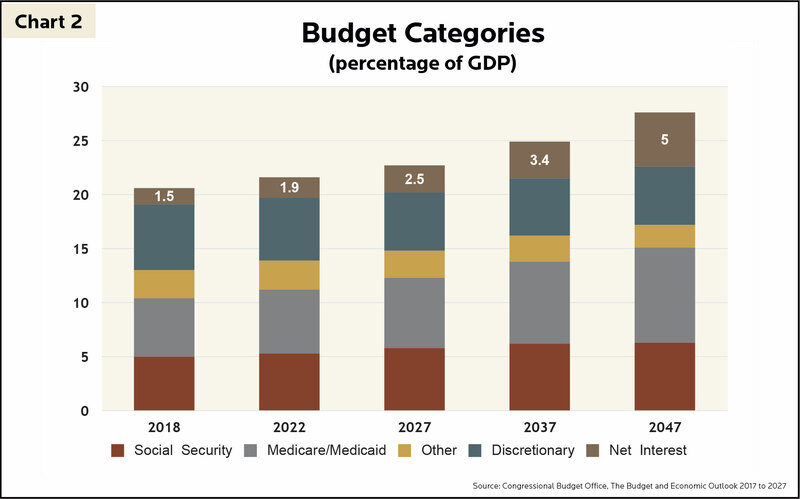 The Congressional Budget Office (CBO) assumes Social Security and Medicare costs grow by approximately 6% per year, reflecting an increase in the number of beneficiaries and the amount of the average benefit. Outlays for net interest expense due to accumulating debt and rising interest rates are projected to be almost double what they are in 2018. As these costs escalate, it will force a fiscal responsibility wake-up call. A day of reckoning is likely to come sooner than later. A much-needed combination of spending reductions, revenue increases and reform of entitlement programs, such as Medicare, Medicaid and Social Security, will be required to reverse the trillion-dollar deficits and record-setting debt. While borrowers relished the opportunities offered in a low interest rate environment, savers felt pressure. During the era of low interest rates, yield-starved investors took additional risk to meet their income needs by buying bonds with long durations and bond substitutes, such as utility companies and real estate investment trusts (REITs). W hile these investments generally offer higher yields than government treasuries, they are subject to interest rate risk (the possibility that an investment’s value will decline when interest rates rise). Since interest rates have started creeping up, many long-term bonds, utility stocks and REITs have taken big hits. However, higher interest rates will eventually present a buying opportunity for these assets, allowing savers to rejoice. At GHPIA we have actively avoided buying interest rate-sensitive assets during this low interest rate environment. 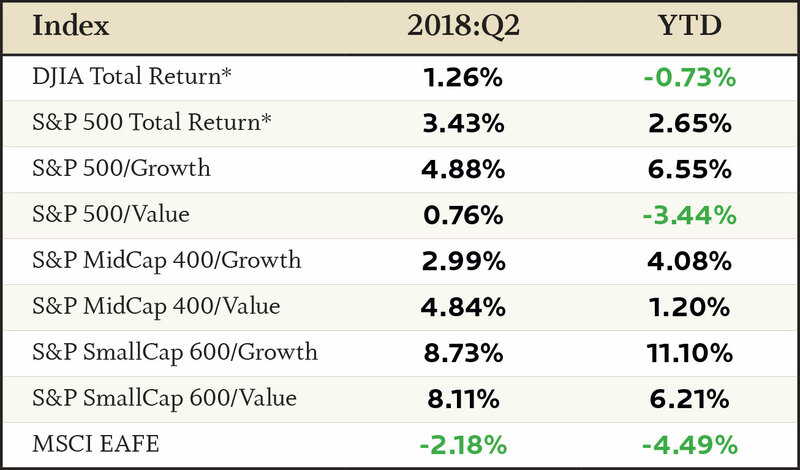 We maintained diversified client portfolios that participated in the upward equity market over the past several years, while harboring adequate reserves when necessary by owning bonds with short-term maturities. We will only begin investing in interest rate-sensitive assets when we believe they offer adequate compensation. In the meantime, savers can now earn 1.5% – 2% in money market accounts, which is below current inflation but higher than the paltry .02-.05% money market funds were yielding a year ago. While corporations with significant debt maturing in the next couple years could face challenging times, many sectors of the economy will benefit from rising interest rates. Rising interest rates often come on the heels of strong economic growth which is likely to boost spending – improving information technology, industrials and consumer discretionary stocks. Financial sector companies such as banks, insurance companies and brokerage firms often see margins expand as interest rates increase. When growing interest rates arise from a healthy economy, banks have fewer non-performing assets as borrowers can make loan payments more easily. Banks also benefit from a widening spread between the rate they pay depositors and the rate they earn from lending and investing. Insurance companies similarly earn a higher return on their bond investments. Brokers not only benefit from the investment spread, but also generate more revenue from elevated trading activity. Rising interest rates behave like a double-edged sword in many ways. Consumers of debt such as credit cards and mortgages will have higher borrowing costs, but banks will be more willing to lend as their margins expand. Existing bond prices will likely decline, but new bonds issued with higher interest rates will eventually present an investing opportunity. The United States government faces a hefty challenge balancing its books in the long-term, but wiggle room remains as the economy continues to grow. It is unlikely the U.S. faces draconian tax hikes or radical policy changes – modest, periodic tweaks to both tax rates and entitlement programs should be sufficient to prevent short and long-term government insolvency. Lastly, we recognize t he importance of higher interest rates. T he Fed’s ability to decrease interest rtes during the Financial Crisis meaningfully aided in the U.S. economy’s recovery. While rates remain low, the Fed has minimal leverage to loosen monetary policy should a recession occur. Rising interest rates fit hand-in-hand with a continually strengthening economy. GHP Investment Advisors, Inc. benchmarks are based on proprietary models. P/E, P/BV and P/CF data are provided by Bloomberg L.P. as of 6/30/2018. Source: Bloomberg L.P. as of 6/30/2018.